It has been a long time since I have reviewed a foundation (have I ever actually reviewed a foundation on this blog? ), but I got this sample a while ago and have been using it a good bit lately, even for my graduation. I wanted to give it a few tries so that I could review it honestly and completely for you guys. Keep in mind that everyone’s skin is different and what works for me may not work for you and what doesn’t work for me might work for you. The first thing that I want to talk about is the coverage. It is probably a medium/medium minus coverage level. It covers more than a tinted moisturizer, so it was good when I wanted something that was a bit fuller in coverage (like graduation). Okay, so let me tell you about what happens when I apply this foundation. It blends in to the skin really well and it seems to be a pretty good match. The shade “I’m Pure 4 Sure” Ivory finally matches me. From what I understand, it is the lightest shade and before my original tan, it did not match at all. However, after the foundation is blended in, it does not look great on my skin. It actually looks like it had already been worn for the whole day. It clings to patches that I didn’t even know were dry. It makes my entire skin look dry. The finish of the foundation meant that I didn’t want to set it with anything, but I’ve done it both ways, and on one particular day, I only set half of my face so that I could compare better. I noticed that it didn’t make a change in the finish, but it did in the feel of the foundation. The side that was not set felt oily to the touch the whole day. It’s the foundation never set. It didn’t look oily by any means, but it definitely felt the way. The side that was set felt and looked very dry. These conditions remained throughout the duration of the day. I was so worried about this foundation that I ended up bringing my makeup wipes to work with me so that I could remove it if it looked too horrible. Thankfully, I didn’t need to use them. During the day, the foundation lasted on my skin. My blush lasted the day and I had coverage on almost all of my face (except my chin). Therefore, I would say that the staying power is pretty excellent. One last comment- this product oxidized like crazy. I tried to take a picture, but I couldn’t get it to come out right. Basically, on the whole, I did not like this foundation. There are definitely pros to this foundation: the lasting power and the blendability. Perhaps if you have oily skin, this would be perfect. However, I would stay away from it if you experience any kind of dryness on your skin. The finish of this product will emphasize it. Even though I didn’t love this foundation, I do want to make it clear that other products from Benefit are awesome and I am a fan of them!!! Let me know if you have tried this foundation and if there are any tricks to making it work for drier skin. I bought this myself. All opinions are my own. I’m not getting paid for this post. 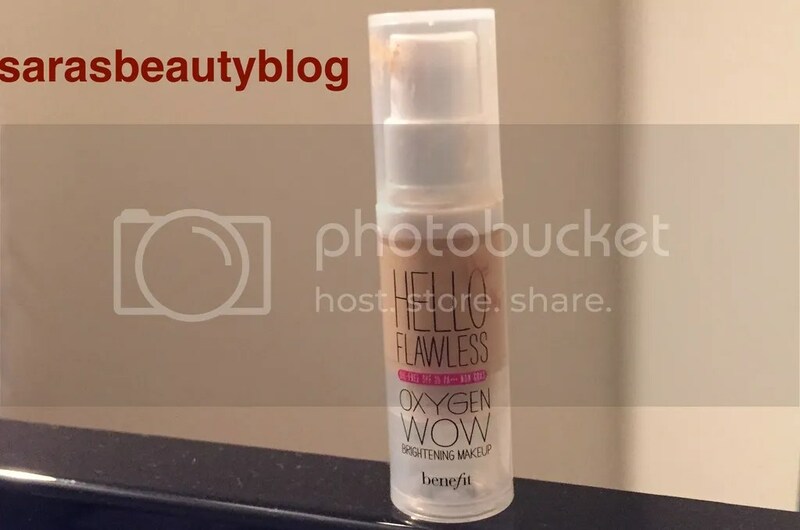 This entry was posted in Uncategorized and tagged foundation, hello flawless, i'm pure 4 sure, ivory, oxygen wow, photo, photos, review, reviews, thebalm. Bookmark the permalink. I never tried this foundation but this is a really good review that covers everything about your experience and I don’t think I’ll try this one out. My skin can get dry where I didn’t even realize too…until I put the “wrong” makeup on sometimes. I’m always treating my skin for this issue or that so it can definitely get dried out and I’m always trying to keep it properly moisturized. The only tricks I’ve really found for getting makeup to blend well when skin is keep multiple types of moisturizers on hand and use each one as needed. So right now I’ve 3 moisturizers and I use a different one depending on how my skin feels or what’s “wrong” with it and I use all of them if I find I put on a new foundation or bb cream and it’s not blending right because of dryness. That probably sounds like a pain but that’s how I deal! I do love the bottle for that foundation though and the name. What does it look like since it’s oxygenized that you wanted to get a photo of? Hm. Do you mix together your foundation and moisturizer? Or do you put one on then the other? That could be a good trick! It got really orange toned on my skin. And much darker. By the end of the day, It looked like I wore a foundation a shade or two too darker than my actual skin color. Oh silly me! I changed it hahaha. I noticed the orange tone in it too, which is why I was scared of it, but I did find that it didn’t look as orange on the original application.